The drive from Currawinya to Bourke was not very interesting and once you passed into NSW the road was much worse with some bad sections of corrugations. My experience is that dirt roads in Qld are OK with some sections of tolerable corrugations but that in NSW the dirt roads are much worse with many sections of very bad corrugations. 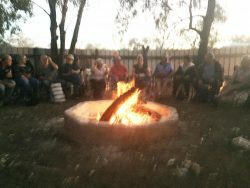 I am staying at Kidman Camp, which is a caravan park in North Bourke, nice quiet park down the back. Tonight I enjoyed a bush poet and the vent included a rice and slow cooked beef casserole, followed by a small lemon curd tart. There was an audience of 80 people, which was a bit amazing in itself. The poet told stories, recited poems and sang songs, which he accompanied on his guitar and others with an auto-harp. He a true bush character and was excellent, we all enjoyed his performance. There was a big central fire, which I was at, and another 4 fires behind us at various places to keep the other rows of people warm. All very well done. I went out to Brewarrina about 100 Km north-east of Bourke to see the aboriginal fish traps that are reputed to be 40,000 years old and the oldest man-made structure. In comparison Stonehenge is 5,000 years old and the Pyramids in Egypt 4,500 years old. 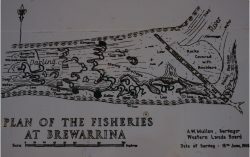 Brewarrina was a meeting place for a number of tribes and, given the work involved in building the traps, it seems it was a cooperative effort. I think that over recent years there has been no maintenance of the traps and it is hard to pick the structures, I was able to find a photo from 1900 that clearly shows the structure. 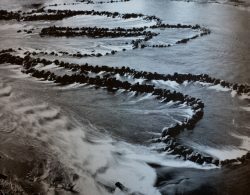 The rows of stones directed the fish moving upstream into ponds which were then closed off to trap the fish which were then speared at leisure. Even though it is hard to see the structure the traps still clearly work as there were numbers of storks and pelicans in the water around the traps waiting to catch their lunch. The structure was built to take advantage of existing rocks and to be effective at different places along the traps at different river water levels. There is drawing of the traps below, which shows how they were constructed, but unfortunately doesn’t show how they worked. There is now a weir just above the fish traps so the Barwon looks quite full. 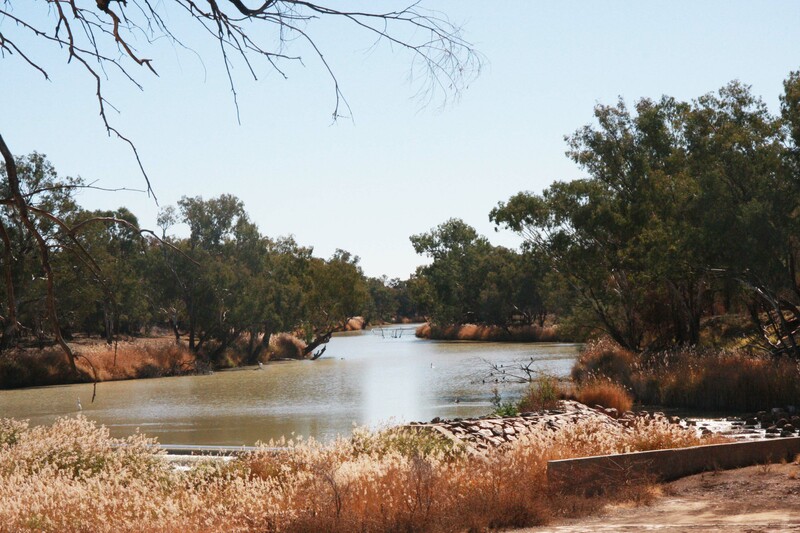 Just below Brewarrina the Barwon joins the Culgoa and becomes the Darling River. 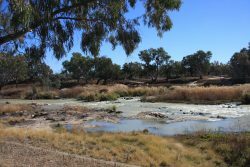 The Bogan River also runs into the darling in this area, but I didn’t see any. 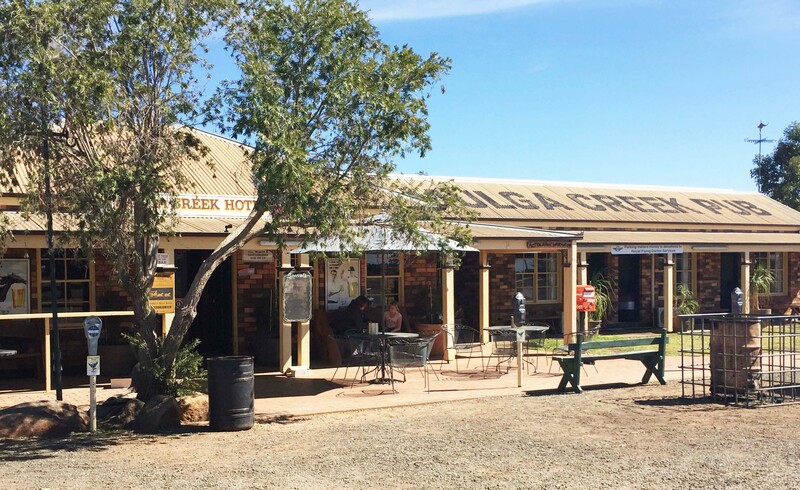 I also visited Byrock about 80 Km south-east of Bourke and had a counter lunch at the Byrock Pub. A small country pub that has been rebuilt after a fire in the last few years. The tables and seats are all made of Mulga with the legs cleverly made from natural logs with forks in them. 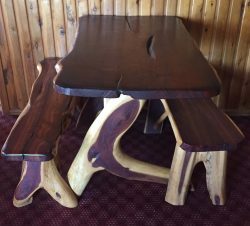 The bars are made from solid slabs of Beefwood that was originally a tropical tree, that I first mentioned seeing at Mutawintji National Park. After lunch I visited aboriginal rock water holes just out of Byrock, which is a sacred place for the local aborigines. 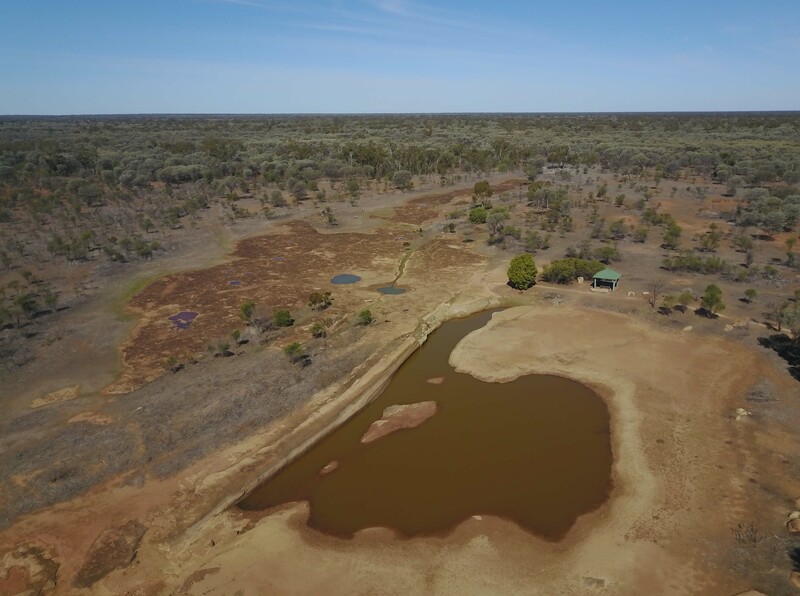 Even in this very dry season there is still water in the rock hole, which is in a low granite outcrop. In the photo you can again see how flat the country is in this area, but there is a good coverage of small Mulga trees. 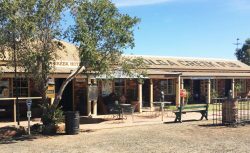 I visited the “Back o’ Bourke centre that Bourke council have built which covers the history of Bourke, its development and the people who developed the area and Bourke or were significant Australians. It comprises 4 corrugated iron buildings three of which cover various aspects of the story and the fourth is a cafe. The buildings are covered by massive shade sails as are some parts of the carpark. 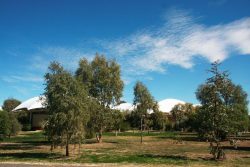 The grounds are beautifully landscaped with plants of the area and the paths that link the four buildings wind through the landscape to the sounds of people talking about their lives. There is even an historic pine log 3 room house that has been moved into the exhibition. It is an ideal photo opportunity for the drone but unfortunately under the airport flight path so I could not fly it. 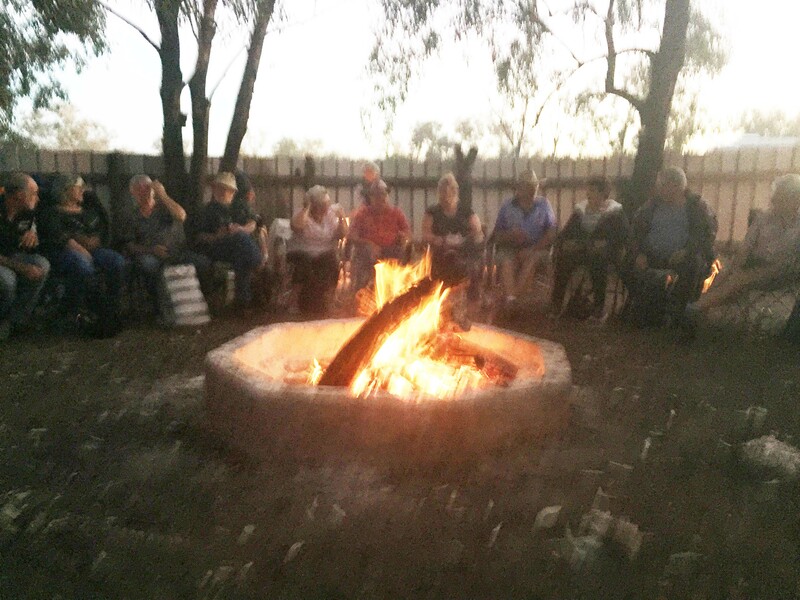 Several notables who made contribution to the area include Henry Lawson who was a leader in the shearers strike, Breaker Morant, and Fred Hollows who is buried in the Bourke cemetery, such was his connection to the area and the people, especially the aborigines. One fact that really struck me that in 1894 Dunlop Station sheared 275,000 sheep and marked 94,000 rams, I find that amazing. The station at the time occupied 4,000 square kilometres. Imaging managing all that. The home block and homestead are currently for sale and this photo comes from the real estate ad. Always interesting to read your blog, Russ. I’ve heard of “Back o’ Bourke”, probably from Dad. 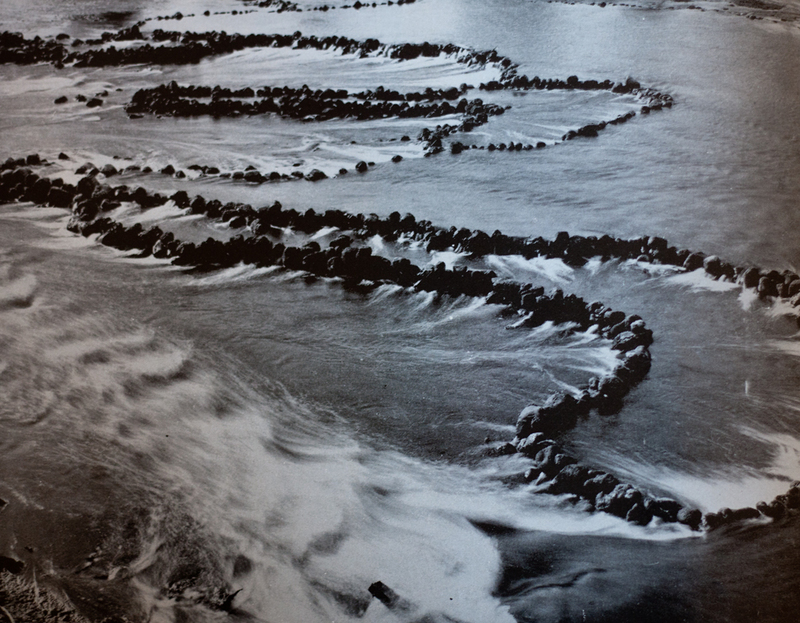 I’m intrigued by the fish traps. It seems a tragedy that they are not being maintained. Do you know why they are being neglected? Surely they are protected monuments or some such like? I don’t think anyone is deliberately causing damage, rather the flow of the river when in flood. 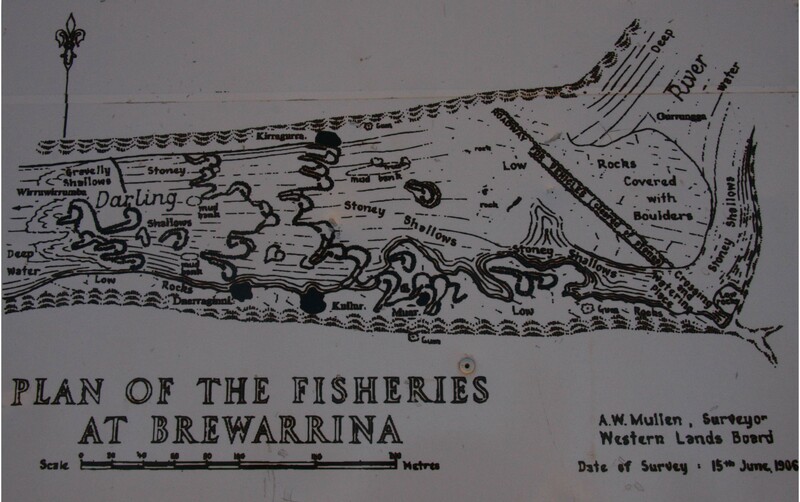 Brewarrina is a tiny town with few resources. 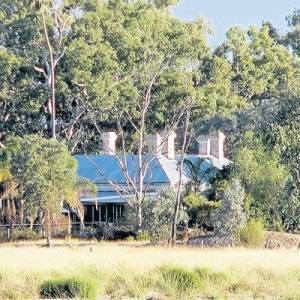 I think it should be a national park and then the state government would have to look after the traps. 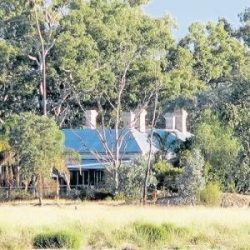 The aborigines in the area no longer lead a traditional lifestyle and clearly lack leadership that has saved things in other places. 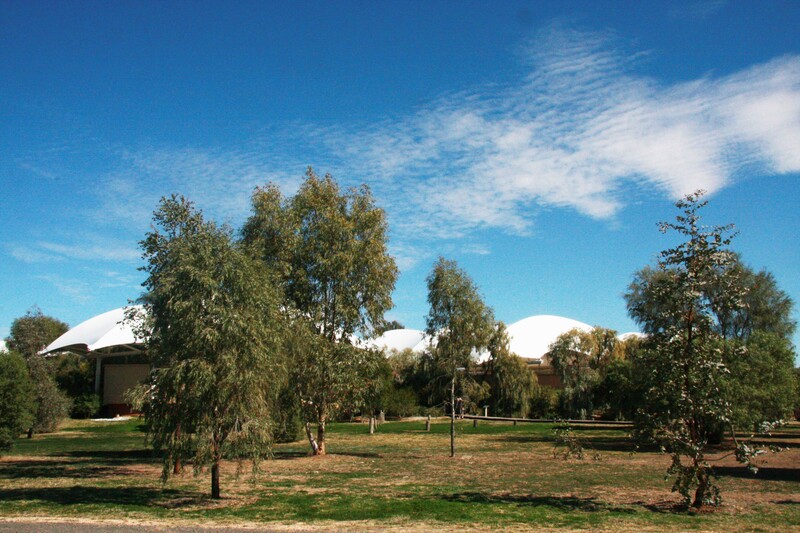 Mutawintji National Park was created as a direct result of the work of 4 aboriginal women. 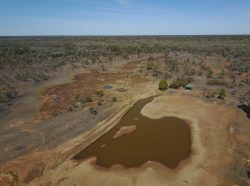 Back o’Bourke is an expression used to describe a remote place without being specific, not so common now but it used to be. Where is it? Oh, back o’ Bourke somewhere.